This flower-lined trail seemed clean at first. 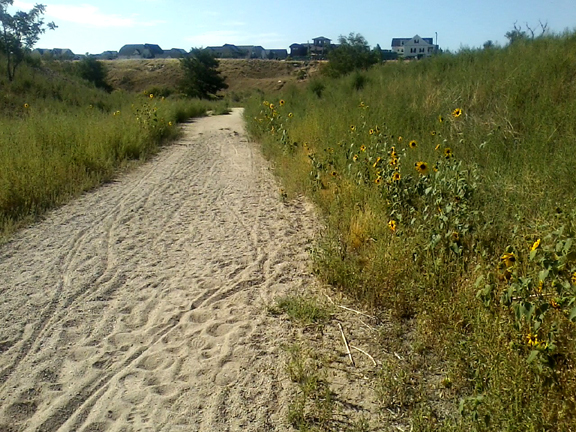 Lured by a free breakfast, lunch and an REI t-shirt, I volunteered to help clean up the Sand Creek Regional Greenway, 25 minutes from my Denver apartment. In theory, picking up other people’s garbage is not appealing; in reality, it was revealing. Armed with hats, work gloves and black and orange bags (for trash and recycling) we scanned for bottles, wrappers and other waste along the sandy path. At first we saw only grasses, rocks and wildflowers. I wondered why the organizers had picked this seemingly pristine spot. Was this a good use of our time? That changed when we wandered into the shrubbery. Invisible from the trail lurked a galaxy of crud. Later, I was told that the deadly 1976 Thompson River flood, that originated 60+ miles from Denver, might have swept the debris into the city. 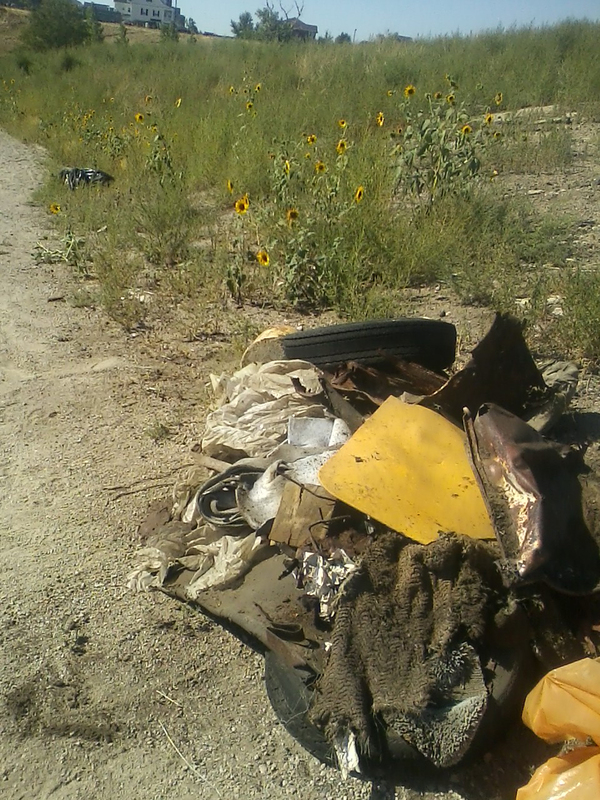 There had been another flood a year ago July that had washed away the campsites of homeless people. Each volunteer seemed to develop a specialty. I dubbed one guy “Michelin Man” since he came across many warped tires. A spry older woman snagged piece after piece of rusted metal. I gravitated toward small objects that poked out of the ground but, when I tugged at them, wouldn’t budge. Michelin Man helped me unearth stuff a few times. One piece of rusted wire turned out to be the handle of a decomposing paint can, the contents hardened into amber-like chunks. Then I found a triangle of rubber, protruding like a shark fin, but even the two of us couldn’t extract it with our hands. We needed a shovel. A constellation of crap that we gleaned from the invisible galaxy of crud. The further from the trail we wandered, the more we discovered: colorful wires tangled into a flat nest; half the sole of a shoe; a yellow hairbrush with sparse bristles; bits of fabric; pieces of shag rugs; encrusted pipes; a corroded can opener. It became a treasure hunt. We were amazed at how much junk was camouflaged by the grass, at how much more there was still to gather. After nearly three hours of scavenging under a hot sun, soaked with sweat and sprinkled with dust, we returned for lunch. One woman showed off two polished pieces of glass she was keeping for herself. I mentioned to another volunteer that collecting garbage in an unfamiliar area was probably easier than if I had been on my own block; I might have harrumphed about the thoughtless neighbors or taken the trash personally. But these objects, delivered by mother nature, happened to land there. We picked them up, marveled at their diversity, and sorted them. That was it. And that’s how it is with whatever psychic debris we carry, delivered downstream by our parents, ancestors, clan, tribe or religion. Rather than avert our eyes, assign blame, or focus on how it got there, we can become fascinated with whatever we stumble upon when we wander off the path of our persona. We can inspect these artifacts with curiosity and decide if they’re treasures, trash or transformable. We can ask for help with the heavy stuff. Then, we can celebrate what we’ve accomplished with a large lunch, even if there’s still more to clean up.